TOGAF, ‘The Open Group Architecture Framework’, is an enterprise architecture framework developed and maintained by The Open Group. Though enterprise architecture is a relatively new discipline, TOGAF has been updated and developed by specialists over the course of nearly 25 years, making it one of the most in-depth frameworks currently on the market. Are you interested in pursuing a TOGAF certification? Good e-Learning offers a variety of enterprise architecture courses, all fully-accredited by The Open Group. We even won the prize for ‘Outstanding Certification Product’ for one of our TOGAF courses at The Open Group Awards 2018. Our TOGAF Awareness course offers a comprehensive introduction to the framework, ideal for students who are new to TOGAF. The TOGAF Foundation course provides everything students need to obtain a TOGAF Foundation certification. 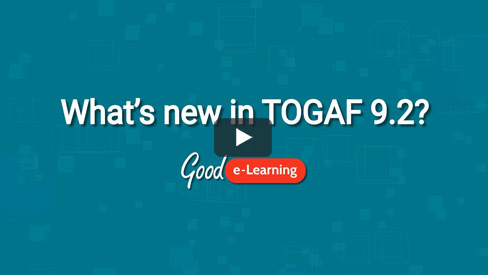 If you are interested in updating your TOGAF certification from version 9.1 to TOGAF 9.2, you can also take the TOGAF Essentials 2018 course. The TOGAF Standard Version 9.2 Certification (level 1 & 2) delivers everything that students need to become FULLY certified in TOGAF. Not only do we cover the theory behind TOGAF, but we also demonstrate how it can be applied in practice. We included a mock exam simulator to help students prepare for the real thing, as well as 24/7 tutor support to help them along. Once you are ready to sit your exam, we will also provide you with a FREE voucher. Can’t find a course in our portfolio which suits you? We can also create a bespoke course built around your own learning objectives and KPIs.